My two kids are currently watching PBS nature shows. While most kids love movies, cartoons, etc., my kids love documentaries, history shows, and animal shows. At first I thought it was a phase, then the phase only got stronger. My oldest wrote about Christopher Columbus in his class journal last week. While most kids were writing about monsters, princesses, what have you, my child was writing a history paper. When his class goes to the school library he goes to the reference section and comes home with science encyclopedias, and he reads them cover to cover. Most of my kids odd behavior I blame on my husband and I. My favorite books are classics and I love social and medical documentaries. My husband was a history major and knows the answer to just about any history question you can ever ask him, and he doesn't just give a simple answer, he goes on for 30 minutes. Apparently my kids are following on the traditions that my husband and I started, hopefully they can find other people that share their same interests. The males in my family love meat, I was a vegetarian for over ten years. To make everyone happy I make meat for dinner 5 nights a week. The other two nights I make vegan or vegetarian meals. Over the years my husband has grown to love many of the vegetarian meals we have tried and his cholesterol levels have stayed nice and low. 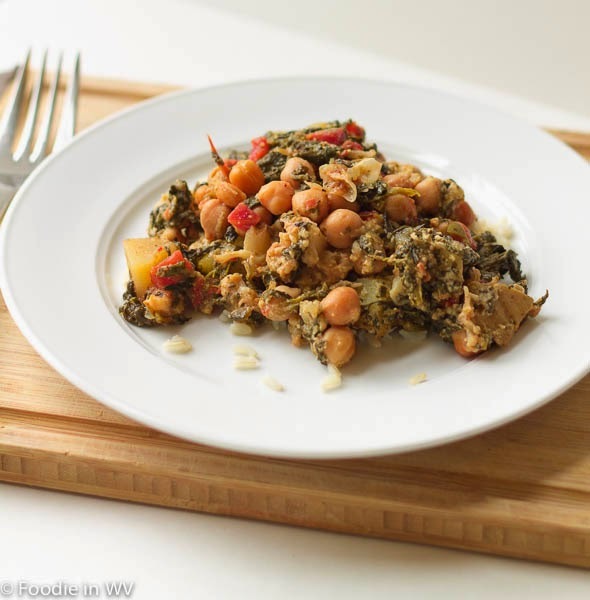 Tonight I tried a new recipe for Slow Cooker Curried Chickpeas and Spinach from the April 2014 issue of the Food Network Magazine. This recipe has 13 ingredients. It takes 4 hours and 20 minutes of total time, 20 minutes of which is active, and makes 4 servings. I only made a few changes to the original recipe. First, I ran out of curry powder so I used a tablespoon and a half of curry powder and a half of a tablespoon of garahm masala. For the cheese I used 8 ounces of Feta and increased the amount of spinach to 15 ounces. I microwaved the spinach and then rang all the water out before adding it to the rest of the ingredients in the crock-pot. Finally, I served the curry over brown rice. The amount of salt in this recipe is perfect. The cheese adds just enough that it doesn't need to be further salted, which is nice since most recipes have to have a large amount of salt adjustment. If you aren't a fan of feta another type of cheese such as paneer would also work. My husband and I really liked this recipe. It was easy to prep in the slow cooker and made more than enough for two meals when served over rice. 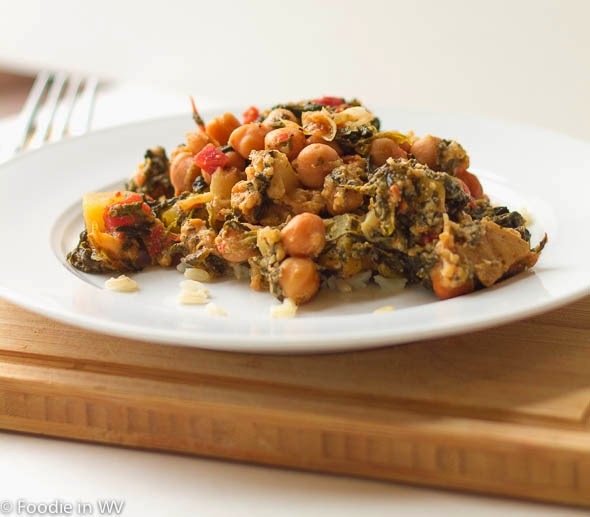 For the recipe go to Slow Cooker Curried Chickpeas and Spinach. This is my kind of dinner, Ann. Love the add of Feta and extra portion of spinach. Too funny - my kids LOVE anything on Animal Planet. Gator Boys is one of their favorite shows. But so is that show Finding Bigfoot lol, so I guess they like shows with fake animals, too. This is a healthy and filling dish! My kids are the SAME about TV. When I was a kid, I was zoned out in front of sitcom reruns all day. They like to learn something from TV, how crazy. :) This recipe looks good, I'm always on the lookout for a new meatless dish. This sounds yummy. 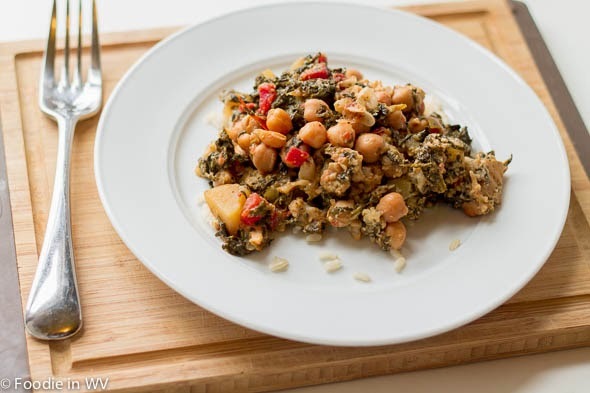 I love chickpeas and spinach, I can't wait to try this recipe.